As a framework it’s closely coupled with Agile Data (http://agile-data.readthedocs.io) which abstracts away database interaction operations. The default UI template set uses Semantic UI (https://semantic-ui.com) for presentation. Agile UI is designed and built for the Agile Toolkit (http://agiletoolkit.org/) platform, with the goal of providing a user-friendly experience when creating data-heavy API / UI backends. Our goal is offer a free UI framework which you can use to easily develop the most complex business application UI in just a few hours; without diving deep into HTML/JS specifics. If during the .COM boom you purchased 1000 good-looking .COM domains and are now selling them; you will need to track offers from buyers. You could use Excel, but what if your staff needs to access the data, or you need to implement business operations such as accepting offers? Agile UI is ideal for such a scenario. By simply describing your data model, relations, and operations; you will get a fully working UI and API with minimal setup. Your domains such as “happy.com” receive a lot of offers, so you want to place a special form for potential buyers to fill out. To weed out spammers, you want to perform an address verification for filled-in data. Agile UI contains a Form component which you can integrate into your existing app. More importantly, it can securely access your offer database. You need a basic mobile app to check recent offers from your mobile phone. You can set up an API end-point for authorized access to your offer database, that follows the same business rules and has access to the same operations. You want to use serverless architecture where a 3rd party company is looking after your server, database, and security; you simply provide your app. Agile UI is designed and optimized for quick deployment into modern serverless architecture providers such as: Heroku, Docker, or even AWS Lambdas. Agile UI / PHP application has a minimum “start-up” time, has the best CPU usage, and gives you the highest efficiency and best scaling. You are a busy person who needs to get your application ready in one hour and then forget about it for the next few years. You are not particularly thrilled about digging through heaps of HTML, CSS, or JS frameworks and need a solution which will be quick and just works. $app is an object representing your Web Application and abstracting all the input, output, error-handling, and other technical implementation details of a standard web application. In most applications you would want to extend this class yourself. When integrating Agile UI with MVC framework, you would be using a different App class that properly integrates framework capabilities. For a Component the App class provides level of abstraction and utility. For full documentation see Purpose of App class. $db this is a database persistence object. It may be a Database which is either SQL or NoSQL but can also be RestAPI, a cache, or a pseudo-persistence. I have used Persistence_SQL class, which takes advantage of a standard-compliant database server to speed up aggregation, multi-table, and multi-record operations. For a Component the Persistence class provides data storage abstraction through the use of a Model class. Agile Data has full documentation at http://agile-data.readthedocs.io. Offer is a Model - a database-agnostic declaration of your business entity. Model object represents a data-set for specific persistence and conditions. In our example, the object is created representing all our offer records that is then passed into the CRUD Component. For a Component, the Model represents information about the structure and offers a mechanism to retrieve, store, and delete date from $db persistence. CRUD is a Component class. Particularly CRUD is bundled with Agile UI and implements out-of-the-box interface for displaying data in a table format with operations to add, delete, or edit the record. Although it’s not obvious from the code, CRUD relies on multiple other components such as Grid, Form, Menu, Paginator, and Button. Fully utilizes abstraction of Web technologies through components. Contains concise syntax to define UI layouts in PHP. Has built-in security and safety. Decouples from data storage/retrievel mechanism. Designed to be integrated into full-stack frameworks. Abstains from duplicating field names, types, or validation logic outside of Model class. Creating admin backend UI for data entry and dashboards in shortest time and with minimum amount of code. Creating MVP prototype for Web Apps. The component is a fundamental building block of Agile UI. Each component is fully self-sufficient and creating a class instance is enough to make a component work. By default, class names specified as the first array elements passed to the add() method are resolved to namespace atk4\ui ; however the application class can fine-tune the search. Components rely on Template class for parsing and rendering their HTML. The default template is written for Semantic UI framework, which makes sure that elements will look good and be consistent. As you add more components, they will appear inside your layout. 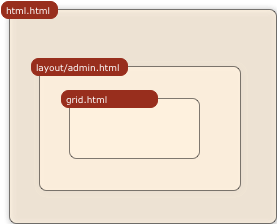 You’ll also find that a layout class such as LayoutAdmin will initialise some components on its own - sidebar menu, top menu. If you are extending your Admin Layout, be sure to maintain the same property names to allow other components to make use of them. For example, an authentication controller will automatically populate a user-menu with the name of the user and log-out button. Some actions can be done only on the server side. For example, adding a new record into the database. Agile UI allows for a component to do just that without any extra effort from you (such as setting up API routes). To make this possible, a component must be able to use unique URLs which will trigger the call-back. 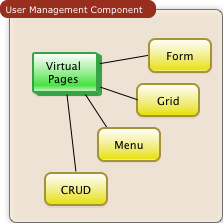 Extending the concept of Callbacks, you can also define Virtual Pages. It is a dynamically generated URL which will respond with a partial render of your components. Virtual Pages are useful for displaying a UI on dynamic dialogs. As with everything else, virtual pages can be contained within the components, so that no extra effort from you is required when a component wishes to use a dynamic modal dialog. Agile UI is designed for data-agnostic UI components which you can add inside your application with a single line of code. However, Agile Toolkit goes one step further by offering you a directory of published add-ons and installs them by using a simple wizard. Technologies advance forward to make it simpler and faster to build web apps. In some cases you can use ReactJS + Firebase but in most cases you will need to have a backend. Agile Data is a very powerful framework for defining data-driven business models and Agile UI offers a very straightforward extension to attach your data to a wide range of stardard UI widgets. With this approach, even the most complex business apps can be implemented in just one day. You can still implement ReactJS applications by connecting it to the RestAPI endpoint provided by Agile Toolkit. information on setting up API endpoints is coming soon. We recommend that you start looking at Agile UI first. Continue reading through the Quickstart section and try building some of the basic apps. You will need to have a basic understanding of “code” and some familiarity with the PHP language. QuickStart - 20-minute read and some code examples you can try. Core Concept - Read if you plan to design and build your own components. If you are not interested in UI and only need the Rest API, we recommend that you look into documentation for Agile Data (http://agile-data.readthedocs.io) and the Rest API extension (coming soon). We have written a few working cloud applications ourselves with Agile Toolkit and are offering you to view their code. Some of them come with tutorials that teach you how to build an application step-by-step. If you represent a group of students that wish to learn Agile Toolkit contact us about our education materials. We offer special support for those that want to learn how to develop Web Apps using Agile Toolkit. If you maintain a legacy PHP application, and would like to have a free chat with us about some support and assistance, plesse do not hesitate to reach out. We do recommend that you come back and learn those technologies after you have mastered Agile Toolkit. Agile Data offers abstraction of database servers and will use appropriate query language to fetch your data. You may need to use SQL/NoSQL language of your database for some more advanced use cases. There are also ways to deploy your application into the cloud without knowledge of infrastructure, Linux and SSH. A good place to start is Heroku (https://www.heroku.com/). We reference Heroku in our tutorials, but Agile Toolkit can work with any cloud hosting that runs PHP apps.